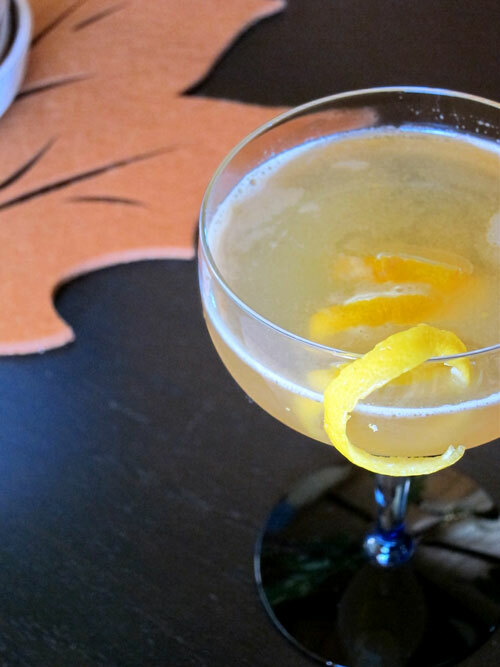 The classic Sidecar is a versatile drink that never fails to please. Cognac, lemon and Cointreau in a proportion that can be used to make countless other drinks. Swap the cognac for tequila, lemon for lime and you’ve got a margarita. You’d be surprised the amount of drinks you can make if you know the proportions for a Sidecar. I tend to make a lot of them, not just for myself but for friends who come over and are unsure what they want to drink. Sidecar it is, and it’s always a hit. I’ve recently had an infatuation with Armagnac, the lesser known cousin of Cognac. Like Cognac it is also from a certain region in France, (Gascogne A.K.A. Gascony in English), and made from grapes. I’d like to do a post in the future detailing the differences between the two but here is a basic primer for now. Think of Cognac as the ultra-smooth spirit, no bumps along the way just a rounded silky flavor profile. While ultra-smooth is great, it also offers no surprises. Armagnac, on the other hand, is Cognac’s wilder cousin; just as brilliant but not as predictable. It offers a wider range of flavors. Most major Cognac houses blend their products to create a signature flavor but Armagnac has a tendency to make certain attributes really pop. It is up to the distiller to choose which flavors they want to accentuate. It’s this freedom to explore that makes Armagnac so exciting to me. Don’t get me wrong, I still love Cognac but Armagnac is new and exciting, it offers greater depths to explore. Two comparable cognacs usually taste similar to me, however, I have yet to find two similar Armagnacs. With this new love I set out to make a new Armagnac Sidecar. Simply swapping out the cognac made a fantastic Sidecar but there was more room for exploration. The inspiration came easily in the form of a gift of Domaine de Canton from my good friends Telene and Konstantin. I thought to myself, an Armagnac Sidecar with a ginger liqueur should do quite nicely. Indeed it did, the resulting drink was still familiar as a Sidecar but it had an edge. Mission accomplished. Shake and strain into a chilled glass. You can use a partly sugar frosted rim in traditional sidecar fashion, but I prefer a lemon twist. So happy to hear about your recent infatuation with Armagnac, I could not agree more with your take on it I especially like your comment that Armagnac is Cognac’s wilder cousin; just as brilliant but not as predictable. I have been working with Armagnac in the NYC market for 2 years now and have found that once people try it they are drawn to that wild character and the really wide range of flavors that it has to offer. Thanks May, it really is a fascinating and undiscovered spirit. Rye whiskey and bourbon will continue to be my favorites but armagnac is right up there with them. Stay tuned to the blog, I have a couple more armagnac related posts coming up. Love it – can I post on my Armagnac website? Mark, absolutely feel free to post it on your site. If you post the recipe directly please give a quick credit and a link to my site. Thanks so much.